GC3N887 REALLY SideTracked - Crookwell (Traditional Cache) in New South Wales, Australia created by GLISS! 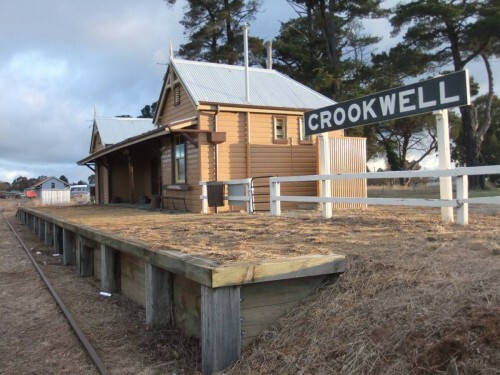 This gorgeous little railway station marks the end of the Crookwell Branch line. There are about 8 stops between here and Goulburn, The other stations/sidings have been dismantled. The line operated from 1902 with last passengers travelling in 1974 and last goods in 1985. There is an active historical society that has ambitions to repair parts of the line so that historical trips can be run. The Dame Mary Gilmour Park is being developed next to the station. Over the next few years, this area should become increasingly popular. There are plans being negotiated with various levels of government to create a rail trail between Crookwell and Goulburn. Maybe one day??? ***Update 29/03/2019 - Some changes have been made to the cache page to add this cache to the Sidetracked series. Note - the hint gives you all the information you need to find this one so only check it if you want to shortcut the hunt. Zntargvp ba gbc bs cbjreobk.